Ideally situated on downtown Nassau, Bahamas only private beach and the site of Old Fort Nassau, the British Colonial Hilton Nassau hotel offers a taste of the islands rich colonial history, along with some of the most modern amenities for both business and vacation travelers. What's more, this hotel in the Bahamas is only 25 minutes from Nassau Airport Lynden Pindling International. Recreational facilities are plentiful. The 300-ft long private white sand beach at the British Colonial Hilton Nassau hotel is furnished with lounge chairs and thatched sunshades over-looking the harbor offering a peaceful and secluded setting for an ocean swim or a day in the sun. Use of kayaks and snorkeling gear on the beach is complimentary. Bordered on one side by a tropical garden with swaying hammocks, the hotels freshwater pool offers ocean views and has an expansive sundeck. The fitness center gives you an invigorating workout with state-of-the-art equipment. The British Colonial Hilton Nassau hotel can also organize many trips to perfect your Bahamas vacation, such as reef snorkeling at the famous Stuart Cove, boating and island exploring. Also within 10 minutes of the hotel are golf, tennis, scuba diving, casinos and great nightlife. This luxurious Bahamas hotel also offers a rich variety of dining options including the Portofino Restaurant for international favorites with a Caribbean flare in a fun, relaxed setting with ocean views. The Patio Bar and Grille with picturesque views of Nassau Harbor is ideal for tropical drinks or lunch poolside. In addition, the Palm Court Lounge offers a throwback to the rich colonial past and is the perfect spot within the British Colonial Hilton Nassau hotel to experience a relaxed and elegant atmosphere and jazz music. You can also step into the Blackbeards Cove Lobby Bar for happy hour with great drink specials and tasty snacks. At the British Colonial Hilton Nassau hotel there are 288 luxuriously appointed guest rooms with ocean or island views. All rooms are furnished in tasteful d r, with conveniences such as cable TV/movies, high-speed Internet access, iron and ironing board, mini-bars, voicemail and coffeemakers, as well as with a separate shower and bathtub. One-bedroom suites offer a separate living area with sofa bed, and the two Junior suites and Prime Minister suite are also equipped with Jacuzzi bathtubs and a private rooftop terrace overlooking the harbor. The Executive Floor rooms offer additional features and services such as separate registration area and the Executive Lounge where complimentary breakfast and refreshments are served throughout the day and evening. When holding a meeting in the Bahamas, a convention or a Bahamas wedding, the British Colonial Hilton Nassau hotel is the perfect choice. With 11 meeting rooms this Nassau vacation destination offers over 10,000 square feet of flexible meetings space for up to 400 people and a modern business center. But we know organizing a successful event requires more than securing a place to hold it. So from start to finish, a Hilton meeting coordinator will work with you to make sure everything happens as it should. Your event is sure to go off without a hitch with our high standards, outstanding amenities, exceptional service synonymous with the Hilton brand and Hilton Caribbean Meetings *Peace of Mind Promise*. 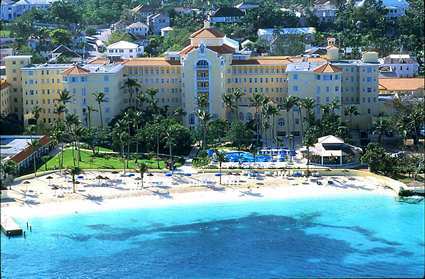 Look no further at hotels in Bahamas - the British Colonial Hilton Nassau hotel is where Nassau travel should take you. Travel should take you places.